Sardar Patel Statue of Unity is Narendra Modi’s political vanity project. India will now have the tallest statue in the world, and it is the Sardar Patel Statue of Unity. It will add to the symbolic and rhetorical pride that Indians like to revel in these days. If you are one of those people who think this will bring loads of pride and millions of foreign tourists to our country, let me ask you one question: Which was the tallest statue in the world till now? If you said Statue of Liberty, you’re wrong. You are one of the many people in the world who have no idea where the tallest statue is. And, this really goes on to show how valuable an achievement the Sardar Patel Statue of Unity is. By the way, the tallest statue in the world was the Spring Temple Buddha in China. But don’t be embarrassed if you have never heard of it. It is never even listed in the top 10 tourist attractions in China. The Great Wall, the Terracotta Army and the Forbidden City are the top three tourist attractions in China. Guess what’s common between them? They are all historical and cultural wonders. Across the world, historical monuments and sites are a far better tourist magnet than any modern construction. That is why the Eiffel Tower gets almost 7 million tourists every year compared to Dubai’s Burj Khalifa, which gets 2 million tourists despite being the tallest building in the world. 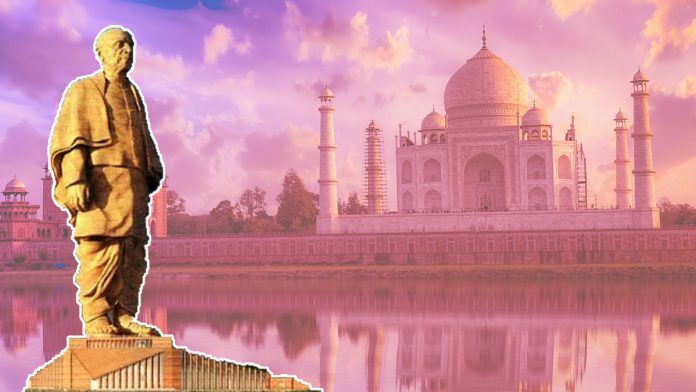 There’s no reason to believe why the Statue of Unity would attract more tourists than India’s top historical wonders like Taj Mahal or Amber fort. It is another matter that BJP MLA Sangeet Som tried his best to denigrate Taj Mahal for his politics. The Sardar Patel statue is about political symbolism, and does not add to India’s rich culture and history. Our country is, in fact, overflowing with historical and cultural monuments but we hardly have the money to preserve them. The Archaeological Survey of India (ASI) has over 3600+ monuments under its custody, including 36 world heritage sites. It has to reach out to the private sector to adopt the monuments. In fact, ASI spent more money to build its new headquarters than it did on conservation of the monuments in 2017. Moreover, only 116 monuments have entry tickets, which can earn revenue. Upgrading services at these monuments, including at the Taj Mahal, would give tourism a better boost than spending Rs 3,000 crore on one political statue. Economically, this statue makes no sense either. The Taj Mahal is the most visited tourist attraction in India, which earns an annual revenue of Rs 25 crore from 8 million tourists. It would be optimistic to hope that the Sardar Patel Statue of Unity will get even a tenth of that number. But even if we assume that the Statue of Unity becomes as popular as the Taj Mahal, it would take more than 120 years to just break even. Add to that the maintenance cost, and it probably will never even become profitable. One can argue that visitor centres, museums and restaurants would help generate revenue but how much of that money will end up in government treasury? The entire Sardar Patel statue project costs approximately $430 million (Rs 3,000 crore). Of which, the cost of just the statue (182 metres) is nearly $200 million (Rs 1,347 crore). The Spring Temple Buddha statue had cost $18 million (128 metre). Even with inflation, it is unfathomable why it is 10 times higher here. Thousands of tribals will hold a mass protest against the statue because their lands were taken away. The statue is also made with the help of Chinese workers. With so many question marks on the Statue of Unity, all we have is the justification of political benefit. But this isn’t be the first time Indian politicians have indulged in political vanity projects of building statues – albeit not at this scale. In the 1990s, Andhra Pradesh chief minister N.T. Rama Rao dreamed of a tall 440-tonne granite Buddha statue in the Hussain Sagar Lake. He was inspired by his visit to New York’s Statue of Liberty. But even before the statue was installed, it fell off the barge that was transporting it and lay flat in the waters for long, causing him much grief. Madhya Pradesh chief minister Shivraj Singh Chouhan also inaugurated a tall statue of Raja Bhoj along the Bhopal lake – obstructing the view for many residents. At the inauguration ceremony, Chouhan said he will try to bring back Bhoj’s goddess’ statue, ‘Vagdevi’, from the British Museum. Modi only took this trend a notch above everyone else and, in his characteristic style, aimed for it to be the world’s tallest statue. Ask yourself this: If Iron Man Sardar Patel was alive today, what would be his response to this gigantic blunder? Next articleWhy is everyone so worked up over the phrase ‘Sarkari Mussalman’? This so called journalist DHRUV RATHEE needs to read news haha. His numbers are nonsense. Statue of Unity will break even in between 30-35 years from now, based on the revenue of 2.1 crores generated in the first 10 days. It could take 50 years, 120 years, 200 years or even more to breakeven, coz computing breakeven on Day 0 is based on assumptions that could differ from person to person, apart from cost of project, all other components are based on assumptions, we should wait atleast for a year to get a better picture of the project with few real values helping to actually calculate the break even. ThePrint has some very good articles but articles like this are very immature, not throughly researched and assume the readers are fool. I’m not telling that any article can’t criticize something but the criticism should be based on facts and reasonable justifications.. many of the above comments have provided enough examples.. i dont need to waste my time for such immature stuff.. this article is so poor that it kind of makes ThePrint looks some fresh college grad project just doing some silly writing stuff! anyways if these kind of nuisance continues on ThePrint then wire, quint and scroll are better to read! Well the cost of Shanghai Maglev was about 1.2 billion USD and that too for a 7 minutes ride to cross 19 miles (source wikipedia) and its suffering huge loses. So, why build them? I guess people should really have some proper sense of economics before even thinking of analysing such projects and this is only one of the hundreds of examples of such projects that can be found. So, just that you got access to a media and you think you can make a statement, you shouldn’t. It really only puts yourself in bad light. Print too should think and analyze before printing such articles. Funny calculation! Build your maths bro.. build your maths..
Just One thing on future the world students will search for the tallest statue in World. There the name comes statue of unity in India…That will be proud moment for Indians which a break even can’t compare. Another Thing Do You Buy Expensive Cars like Merc BMW Audi for its break even or for your status…. So some things in life and country is above profits…..
Now Come to the facts and figures Taj Mahal is not break even till today. But do you know manufacturing cost of it. No right its known for its beauty and culture. That’s what we lack in World because we criticise more and appreciate less…. What a stupid writer, don’t even have basic sense of finance. Wasted my time. Arrey..Mr Author…pls stop being a sadist…It is a befitting monument for generations to come…Certain things have to be done in style and thats the way it is. 90 percent money allocated for various projects are eaten up in corruption and work also is done shabbily but we the people dont worry…but here you cry over money spent on an iconic statue which is masterfully done and delivered with Panache!!! All indians cutting across party lines should be happy. The impact of this will be known in generations to come..
..also dont forget its an engineering marvel from India!! Its true that the government has spent large amount of money on the statue but its not complete waste of money. The author of this article lacks understanding of financial concepts and yet attempted to pretty much state that we won’t see ROI in near future. You CANNOT calculate the break even cost of a large project like this based on the money obtained from gate receipts only!! There are other dimensions to the project which you probably don’t know or your brain couldn’t comprehend at this point. You decided to pick the easiest one and assumed that the ticket will cost x amount of money. Money obtained from gate receipts won’t be a lot but that’s not the focal point of the project. How about you look at the broader perspective where tourism created by this project will directly benefit the hospitality and retail industry in near by areas. You cannot calculate costs willy nilly and make ignorant statements about breaking even. I think the author needs to go get better education and refrain from writing articles based on financial figures. it would be nice if someone could assist him because he is clearly incompetent in this area. All you have done through this article is just advertised your ignorance and taken a dig at the government because its the flavor of the season. Hope the author moves on from just being an “activist and Youtuber” to being a qualified journalist at some point in his career. Thank God, The print was not in the era of Mughals, otherwise they must have questioned the building of Tajmahal! At Least people will get some tourist and get money for livelihood. Else they would become writer and waste others time. Stupid writer. Wasting our time. # it is shame on modi govt that they are busy in only contraversial issues throughout these five years. Keep it up Dhruv ???? Potential tourist to State of Unity, might be a 100 million dollar question. Because, tourist who would google Gujarat places, internet searchers would find long list of visiting places other than historical place(s), e.g. a long awaited case of pending justice to the riot victims which were witnessed in the calendar of February to March 2002, 26 mass-massacres casualty was plus 2000 (official 1000 plus). The riot engineered machinery (majority IAS; IPS; lower judiciary, barring few amongst them) had easily acquitted. Even, the Apex Temple of Justice had exonerated main culprit(s) through a convenient SIT (in-charge on Corporate Payroll). The tourist might be also interested to visit Naroda Patia; Naroda Gam; Gulberga Society; Panchmahal, etc. for finding the truth; failure to provide justice, etc. Mr Rathee, don’t be a sadist or a blind Congi. Everything is not commerce. Culture, heritage, prosperity and remembering Nation builder’s are not measured in terms of money. This monument is certainly an asset and will enhance India’s prestige. The infrastructure and it’s surroundings will provide immene business opportunities and generate employment. Sardar Patel is India’s strongest Politician and a great visionary. This is a befitting tribute to his memory and message to the youth of today. See with a positive mind and you will see a brimming India. Don’t shed negative thoughts please. do you really think that the entry fee for tajmahal which is 10-15 rs. be the same for this newly created sardar vallahbhai patel statue(made for tourist attraction spot) ? it will surely be not less than 100 rs. Very Happy to see that all these bhakts feel proud of the iron Man of India who was a Congressman to the core and banned rss during his time. Sanghis who do not have a single such tall leader like Nehru, Nethaji, Gandhi & so many others have to usurp leaders from Congress as their icons. Dhruv ‘s videos & articles brings right way to think. Hate Modi/ BJP article as usual. He has conveniently not mentioned about the statues of herself, elephants etc got installed by Mayawati. I am really astonished with the level of biased opinions, both anti-modi and modi supporters. The writer just gave his opinion and everyone is entitled to their own. We don’t need to abuse the person. Second, we really need to take positive out of every opinion. No person is perfect and if putting our opinion to front can bring about any point of improvement it should be accepted. This will ensure that the people governing our country will improve too. That’s how a democracy works. Abusing and hate is not the way we should respond to any ones opinion. If it’s flawed point it so. This will keep a discussion healthy. It is not all about the money. An inspiration and the idea behind why this statue was started is far more important than the numbers in the post. May be it wont generate the income or become famous like the historical monuments but what does this generation of people give to our future generations? Imagine if shahjahan has built taj mahal with bricks and sand? he wanted something important to be remembered for many generations to come his respect and gift for LOVE. Taj mahal still stand for symbol of love even today after hundreds of years. Dont you think there were no contemporary romantic lovers existed during shahjahan’s time? If something is really important we should make it like no one has ever done it! you might argue we could have spent that money on people! well if you look at the yearly budget and the amount of money government spends we can just say let’s distribute all that millions of crores to all the people in india and i am sure that will make everyone rich. we dont do that do we! Annual revenue of 25 crore from 8 million tourists? I.e. 3 Rs per tourist? If we assume every tourist spends 1000 Rs on an average at the site n facilities, it’s 800 crore Rs in revenue per year. Cost recovered in 4 years. dhruv look yourself in the mirror and read this whole article…I’m sure either the mirror will break in shame or you will be ashamed by your words for the great Patel ji. Shame on you, atleast forgive Sardar Patel today on his birthday. normally vast projects are undertaken in periods of depressed economic conditions to provide earning avenues to the jobless – and such projects should be constructive to the nation’s economy – our nation is still under the status of “developing” with vast majority below poverty line. So, surely the funds could and should be spent wisely. There are people like Dhruv Rathee and his Chutiya followers who have problem with Statue of Unity. They are claiming that India needs 120 years to recover the money spent on this. Now I have question for people who follow the ideology of recovering money by making monuments in country. Don’t tell me that China built The Spring Buddha to boost their economy, The Great Wall was built to provide a place to click selfie by China, Terracotta Army was focused on attracting adventure travelers, Forbidden City was built intentionally to sell tickets. Sheikh’s built Burj Kahlifa because they were lacking money and wanted to earn by one building by attracting tourists. And the best one.. Shahajahan Built TajMahal so that after 400 years, few international terrorists could see her wife’s grave and pay for it. According to this Chutiya Dhruv Rathee, India is generating INR25 Crore from 8 million tourists at Tajmahal and people are more interested to visit TajMahal than Statue of Unity. Well, first of all he doesn’t even live in India so he don’t have any right to speak a word for my India. Absolutely right. The Taj is one of the wonders of the world, constructed in the middle ages without modern technology. Besides being a work of art and exquisite beauty, it tells an awesome, inspiring historical tale. I doubt whether the great Sardar Patel will be impressed with his so called Statue of Unity. Paying tribute exorbitantly and ignoring the most plaguing issues right from the farmers to education and rapes. Imagine 3000 crores spent for the Actual upliftment of the state would have made Iron Man truly happy. All those who are taking sides for this expenditure and tribute are living in a bubble and part of the worst politics. All activists are like this only. Why not asks the president and all ministers, MPs and VIPs to vacate palatial house to save huge recurring expenses in maintenance. However, I agree that there is no need of building all such grand things in India for leaders who live frugally. But BJP has to outdo Congress. Dhruv rathee you are such a dumb..do u know what’s the time value of money..if there is a ticket of around 300 rs and we have 3.4 million visitors every year the statue will break even within 16-24 years…do your maths..secondly Patel had a drastic contribution in uniting several princely states..so please stop your agenda..
Modi is Gujarat friendly, not India friendly. Bullet train, GIFT city, Dholera, and many more. MR. RATHEE SHOULD REALISE THAT PEOPLE OF INDIA HAVE VOTED THESE POLITICIANS WITH TOTAL POWERS TO DOLE OUT OUR TAX MONEY IN DIFFERENT WAYS TO PUBLIC BY WAY OF SUBSIDIES AND OTHER NONPRODUCTIVE UTILITIES. NO BARKS CAN OBSTRUCT THEM. Sardar Patel is already famous. Who built Sardar Sarovar, Sardar Patel airport at Ahmedabad or SP university at Anand? Vallab Bhavan at Bhopal? I agree with every word said… Good to see atleast one concerned citizen asking necessary questions at the right time. And I don think this publicity is even required for a country like India. We have things which people only can dream off. Its not wrong to say do not waste money and resources on new things but to preserve the old ones. How much you earn to spread rumours about our beloved Prime Minister. And regarding comparing spring Temple buddha statue vs Statue of unity did you lay down whether all other factors are equal? 5) Not sure if one is earthquake proof upto 6.8 scale but other is. I think 3000 crore(Rs 30 per head) is actually not that costly considering it will inspire and remind every Indian about “unity in diversity” and experience it live when they visit it. Regarding the cost, hopefully 3000 crore is well audited and there is nothing to be suspicious about.. RTI Act benifits can also be availed incase you want to be sure. In nation building, giving money to poor is not enough.. symbolism, inspirations,glory pride etc are also needed simultaneously..
@Devayat did you read the last sentence? How do you think honourable Sardar Patel would like a tribute to himself? If you know about the iron man’s life then you would know he would be disappointed by this. There are already dozens of roads, bridges, schools etc. after his name. Isn’t that enough? https://edition.cnn.com/travel/article/china-builds-bigger-buddhas/index.html can u take i dhruv ? What will our future generations have if we dont make it now…. Sure it will take 120 years to break even but your mouths are only open coz of that person whose statue is made else you would be in british rule starving for food on the edge of street so keep yoir mouth shut we know you do habe audacious knowledge of economics and maths bit world dont run on maths its a feeling of nationalism oneness of culture….. So keep your farting mouth shut! PS not a supporter of any govt just a normal guy describing if shah jahah would have thought that tajmahal will take 198 years to become a monument he would not have made it! Anyone can just blame anything. But it’s a blunder to think of that it has been built to reach any economic breakeven. So the minutes of your life, you spent to calculate it, are wasted. Shahjahan, Modiji didn’t think of breakeven. They just make it. They are we, who just post and reply upon. Seems verry biased analysis. It is not important how much return will come as revenue. The issues are: 1. To honour a most important personality of modern India with whom the congress party has done injustice. 2. It is also important how much money the government treasury will get. Government includes the autowalls, restaurant walls, hotel wallas, all local shops, the petrol bunk wallas-everone. Print is anti BJP. And all the stuff are inhrently to malign BJP. If you have to give balance view tell the mistakes of Nehru Gandhi family, how many statues we have of them. And by the way , Sardar Patel would be happy with this statue, wherever he is. At least Indians will read about Sardar Patel, who he was. My many well educated Bengali friends do not know about Sardar Patel as the communist history was taught to them with little or no mention of Sardar Patel in the text book. The author says “The Spring Temple Buddha statue had cost $18 million (128 metre). Even with inflation, it is unfathomable why it is 10 times higher here.” Where as if you click on the link of Spring Temple he himself has shared, it says the project cost was $55 million. Seriously you guys publish anything even witjout validating?? See who is the writer…..Dhruv Rathee.That explains all.Biased opinion which doesn’t matter.This guy will spend his entire life criticizing our Prime Minister. I bet he loves Modi criticizing whom he has made money on YouTube. These so called useless activist find everything irrelevant in modi ‘s work. How they compare a statue with that of business?? Whether the useless Shahjahan built Taj Mahal out of his father’s resources… Bootlickers of Congress..
Gujarat is already lacking in historical and religious architecture, this would surely provide boost to tourism of gujarat and Nation. Yes Devayat, everyone is so biased. Except you ofcourse. You are so balanced that you drip facts and objectivity. Not. Plzz care to read the wiki pages of both statues before spewing venom on public platforms sir! Don’t just mislead people for god’s sake..
And also the amount of material being used is widely varying! A very good write up. The Iron Man would be grieving in his grave for wasting money on one person’s vanity who will use Sardar’s statue to target Congress. Any protective gear to prevent birds using the tallest leader’s head to ease like it often do on the head of the statues of some of other contemporaries. It is a merchant ‘s view , not that of a citizen. There are a few things that puzzle me about this statue. Mr Modi was the CM of Gujarat for three terms. Why did he not have this statue built during those years? It would have also cost much less 10-15 years ago. Sardar Patel was a tall leader, but surely not the tallest. Then why the tallest statue for him? Nehru’s name would be an anathema to BJP and Mr Modi, but how about Mahatma Gandhi? He too was from Gujarat, if that were a criteria, and by all accounts “many inches” taller than Sardar Patel! I do not want to sound disrespectful, but I sincerely believe that such a monumental amount of our poor country’s precious resources shouldn’t have been spent on ANY monument. This reflects not adoration on the part of those who were behind this decision, but their insensitivity to stark realities. If it were unalloyed adoration, as I said, this statue would have got built during Mr Modi’s very first tenure in Gujarat. This might be you, who don’t know who is Sardar and we are really sorry for such an upbringing. But do remember the world know who is Sardar and “Sardar who?” is never going to happen. There are some things which are beyond breakeven and RoI. Every citizen of the place within 50/100 ksm around the place will be thankful that such a tourist attraction was built which changed their lives forever. Stop being critical, or pessimistic or be so negative about such long term plans… It will be a beautiful heritage for our great great grand children and on lighter note, I am not sure if Taj Mahal will survive this long journey till then… ENJOY!! Neither article nor research. Full of even, if, then, and assume. The writer always against Modi. 95 percent of all his videos are anti Modi. If the statue was built by other leaders(non bjp) he would have appreciated it. Shah Jahan did not built tajmahal thinking that it will generate revenue to India. the writer seems to a sadist. The print has no business but to malign the name of our respected prime Minister. And it is for sure that he didn’t believe it for himself. The writer is biased and misinformed in many ways or how could he compare the monuments built in the name of two completely uncomfortable persons. And do we make monuments tl earn money or to pay tribute to our leaders? There is a limit to the tribute to our leaders especially in a country which is developing. at what cost? tributes for Rs.3000 crore? this money could have been put in so many other areas. Infrastructure development, roads, railways, metros, reduction of pollution, replaying farmers loans. Could have been used for other military purposes, hospitals could have been built, poverty could have been combated. Of course, you’ll not understand this, keep on the blindfold on your eyes and keep preaching Namo Namo. But will Taj Mahal exist in the next 120 Years ? And will this Made in China idol last for more than 10 years ! Another showpiece project coming up off the Bombay coast, even as the state’s farmers face the worst drought in six years.